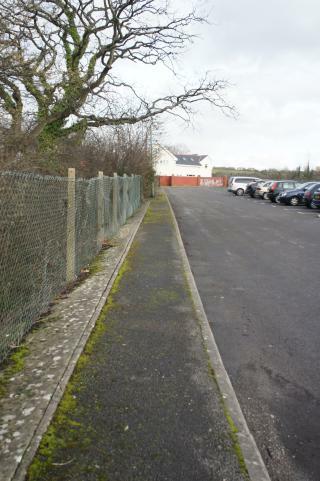 Car park which is used by train commuters at Eastbrook station (near Dinas Powys). Lots of hard standing and excess space. I think there are possibilities here for raised beds, with seasonal annuals and perennial mixtures of edibles and flowers. A good solution could be using one tonne bags as raised beds - these are cheap and not permanent so a good way of testing the waters before investing in more permanent structures. They would fit on the path on the edge and so be safe from reversing cars. Another possibility would be to take up space at the far end of the car park and make use of that rather stunning red brick, southish facing wall. Could use either one tonne bags again and grow temporary crops e.g. beans etc or at some point put more permanent large and deep raised beds in and grow espalier fruit and climbers. It would be Network Rail that need to be approached I think. If others are interested in this venture let me know. Eastbrook is about 12 minutes away from Cardiff central. Its about 7 minutes walk away from my house and I would be happy for the facilities to be used there.